In this past weekend’s missive, “Did The Powell Put Change Anything?,” I discussed the surge in the market following Jerome Powell’s change of stance on Fed policy and the potential for a Trump to acquiesce to China in order to boost the stock market. “While Goldman is leaning more towards an “escalation,” President Trump has staked his entire Presidential career to the stock market as a measure of his success and failure. If President Trump was heading into the meeting this weekend with the market at record highs, I think a “hard-line” stance on China would indeed be the outcome. However, after a bruising couple of months, it is quite possible China will see an opportunity to take advantage of a beleaguered Trump to keep negotiations moving forward. Not surprisingly, that is exactly what happened. Nonetheless, as I also pointed out, the market did reach extremely oversold levels during the October/November correction which provided the necessary “fuel” for a short-term rally. All the market needed was a “reason” and Trump’s weakened stance with China over trade provided just that. The good news is that on Monday the market cleared the 50- and 200-day moving averages. This was an important level of overhead resistance the market needed to clear to get back onto more bullish footing. However, in order for that break to be validated, it must hold through the end of the trading week. “The nearly 5% gain this past week was an impressive surge off the primary downtrend’s lows from just the previous week, with some key resistance trend lines taken out. The model’s technical indicators leapt in response, notably tripping two key indicators (index vs month-end trend and statistically significant weekly percent increase) from sells to buys. Monetary and sentiment indicators improved some as well. If he is correct, then our longer-term indicators should turn positive the weeks ahead as well. As noted at RIA PRO we did add some equity exposure to portfolios on Friday, but are still holding a higher level of cash than normal. As shown below, the 61.8% Fibonacci retracement level, and the 2016 bullish trend line, have remained formidable adversaries to the previous rally attempts. However, if the lower “sell signal” is reversed, such would likely coincide with a breakout above resistance and confirm a new uptrend is underway. “IMPORTANT: It is the success or failure of this rally attempt will dictate what happens next. So, why did I give Option #2 a greater weighting? This is because, despite the recent oversold surge from lows, the primary backdrop of the markets has not changed markedly. The “trade truce” was nothing more than that. China is not going to back off its position on “Technology Transfers” as that is the key to their long-term economic future. This means that either Trump caves into China or we will be back to a full on “trade war” in 2019. The Federal Reserve is still reducing their balance sheet by $50 billion per month which has removed a primary buyer of U.S. Treasuries at a time when the Government has gone on an unfettered spending spree. Valuation remains extremely elevated despite the recent correction. Most importantly, year-over-year earnings growth rates are set to deteriorate markedly in 2019 as both the effect of the 2018-tax cuts vanishes and end-of-year estimates still remain way too high. Weighing both the short-term bullish view and the longer-term bearish outlook is difficult. 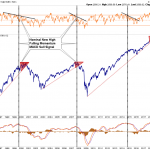 Despite the rally on Monday, the market still remains mired on a primary “sell signal,” has violated it’s long-term bullish trend and faces a substantial amount of headwinds heading into 2019. The risk current remains to the downside, and we must wait until the end of the week to see if the “bulls” can take back the reins of the market. There is little doubt the “bullish bias” persists currently, and the volatility this past year has made managing money more difficult than usual. But that is the nature of markets and how “topping processes” work. Given we are in the “seasonally strong” period of the year, it would not surprise me to see the markets try and muster a rally into January. But there are certainly some challenges to face over the next week or so as mutual funds are now firmly into their annual distribution period and Jerome Powell may reassert his “hawkishness” again next week which could spoil the party. A look at the weekly internals of the market shows some notable deterioration in the advancing-declining issues. 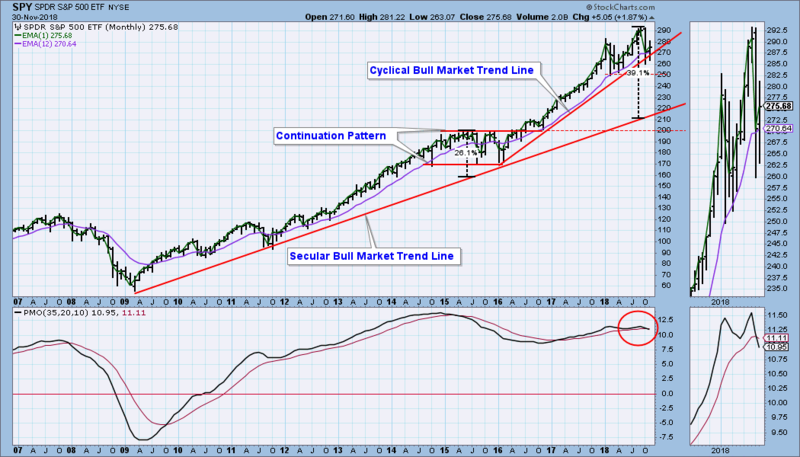 With a weekly “monthly” sell-signal in place, caution remains a primary consideration. Importantly, given these are monthly signals, it does NOT MEAN stocks can’t rally in the short-term. It simply suggests there is selling pressure on stocks and the path of least resistance currently is lower. Again, while a short-term bounce in likely given the recent sell-off, it will require a move to new highs to reverse the currently more “bearish” dynamics at work in the market. And right now, the probabilities remain to the negative. We haven’t gotten to that point just yet.